User tagging with email alerts and Perusall inbox alert. Tagging of annotations as questions automatically when a user uses a question mark. Confusion report to see where students have the most questions. Provides a downloadable .csv of all annotations in an assignment. From your course, click Settings , choose Navigation . Scroll down to the list of disabled apps, until you get to Perusall. Click the settings icon next to Perusall , and choose Enable . Scroll down to the bottom of the page, and click Save . 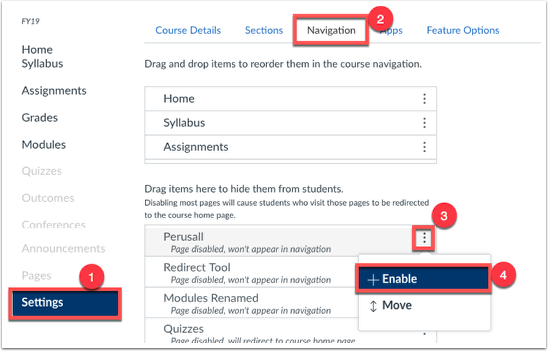 Perusall will now appear on the left navigation in your course. As an instructor enrolled in the course, once you click on the Perusall tab, a course will be created within Perusall. You can then integrate Perusall Assignments into Canvas by following these steps. For more information on roster syncing, and linking an assignment from Canvas to Perusall, please see the following Overview of LMS Integration help article. For more general information on Perusall, please visit the Perusall website.